July 2009 ~ I Can Do That! I had an OMG! moment halfway through baking this loaf when I opened the oven to rotate the pan for even baking. The bread had an enormous oven rise doubling its height for maybe several reasons: I didn't roll the dough tight enough and so it spilled its gut out from one side, I used a loaf pan that was too small, I proofed the dough too long, or the instant yeast was overly frisky. When I removed the finished bread from the oven I couldn't help giggling like a fool because it looked so friggin' ugly. 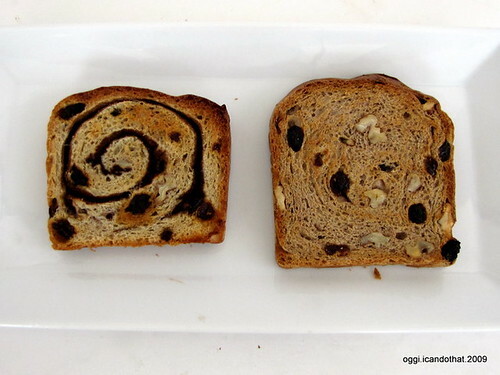 I was expecting a cavernous interior which the bread thankfully doesn't have, just a little bit, but the slices look funny like a person's profile. It is also not very swirly. I made this bread when I read about it here; her loaf is so perfect and beautiful and because I love swirly breads I just had to make it. I didn't have chard but I had beets with its greens still attached. After a quick online search I found out that beet greens are edible and they are nutritious too. 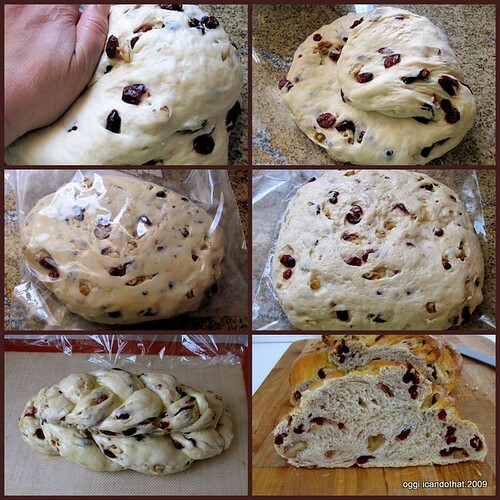 For this recipe, I used challah dough. The slices are delicious and light as feather; it's like eating a piece of cloud with bits of beet greens, garlic, and savory Parmesan cheese, very good with Beets and Yogurt Salad. 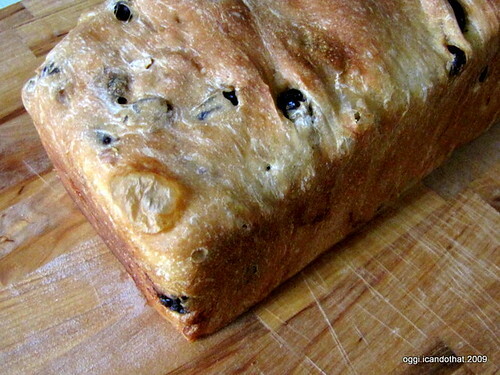 I will make this bread again using chard or other greens and hope it will improve in appearance. Growing up in the Philippines I remember eating boiled mungbean soup and fried fish almost EVERY Friday. Most Filipinos serve a vegetable dish for lunch and dinner and mungbean soup or stew is a favorite because it's cheap and nutritious. After boiling the mungbeans, my mom used to set aside a few cups for us children to eat as a snack with added milk and sugar. It is delicious, weird maybe, but delicious. I cook mungbean soup once a month and pair it with an adobo dish. I usually add a saute of garlic, onions, and tomatoes after boiling, other times I prepare it Spanish style boiling the uncooked mungbeans together with garlic, onions, a bay leaf, and olive oil. Regardless of the way I prepare mungbeans, we always prefer the dish meatless. For color I added fresh pepper leaves from my garden. I don't know if the pepper leaves have nutritional value but I like them for visual appeal. Clean and pick out foreign materials from mungbeans. Rinse with water 3 times and place in a medium sauce pan. Add water to top 2 inches above the beans. Turn heat to high, let come to a boil. Turn heat down to low, cover, and simmer until tender, about 30 minutes, checking and adding more water if necessary. In another medium sauce pan or wok, heat the oil and saute garlic and onion for 4 minutes. Add the tomatoes, salt, black pepper, and the cooked mungbeans including the water. Cover and simmer for 20 minutes, adding more water as needed. Taste and adjust salt. Turn the heat off and mix in the pepper leaves if using. Transfer into a serving bowl and serve with rice. The recipe for English Muffins, the 12th in The Bread Baker's Apprentice Challenge is very different from the recipes I use for making English muffins. Those recipes including PR's test recipe have the consistency of thick pancake batter which cannot be shaped into balls or they will spread out all over the place. The batter is measured and poured into crumpet rings set on a preheated griddle. Baking soda mixed with water is added just before cooking the muffins which helps create the must have sponge-like "nooks and crannies" for an authentic looking English Muffins. Without the holes the muffins will just be an ordinary flat round white bread. This Alton Brown's recipe which I still have to try looks okay but has a very short rising period. I was reluctant to make the BBA's English muffins knowing I will be disappointed if they come out without air pockets. I decided to make it into a loaf which the book says is an option. I used whole wheat Indian-type ATTA flour for all of the flour. Atta flour has a slightly higher protein content than bread flour. I got the atta flour, which is grown and milled right here in the US, from a Korean grocery store. After shaping the dough into a loaf I rolled it on fine corn meal and sprinkled some more on top. 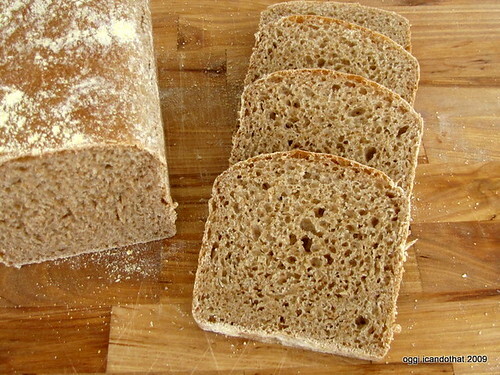 It was a pleasant surprise to find that the bread slices have nooks and crannies with soft but chewy flavorful crumb, and the crust is crunchy when toasted and therefore have the same qualities of really good English muffins. 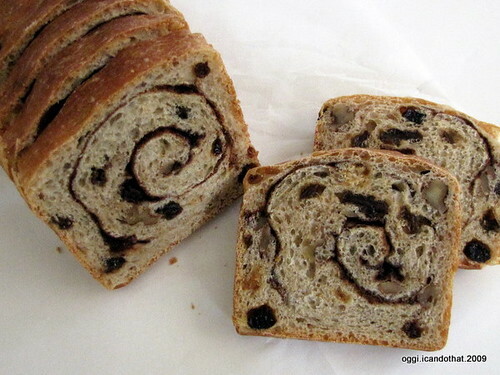 I'm not sure if the flour had anything to do with the texture and flavor but I will make this loaf again when I feel like whole wheat-y English muffins or when I get the munchies for Sausage Egg Muffin Sandwich. I felt I was being unfair for prejudging the recipe just by reading it. After a few days I made the round ones and just as I thought, the muffins don't have air pockets, are very soft like white bread and not chewy at all. I actually like the rolls, they are very tasty but I won't call them English muffins. White Sangría may seem odd but this drink is becoming more and more popular lately. It looks and it is very refreshing and perhaps tastes a bit lighter than red wine sangría. This recipe if from my Spanish cookbook MADE IN SPAIN by the Washington, D.C.-based Spanish chef José Andrés. Fill a glass pitcher halfway with ice and add the chopped fruits. Tilt the pitcher and pour the cava very slowly down the side; this will help retain the bubbles. In another pitcher or bowl with spout, combine the brandy, Licor 43, white grape juice, and sugar, then pour the mixture into the sparkling wine and fruit. Give a quick stir and add the mint sprig. When serving, make sure each glass gets some ice and fruits. This white sparkling wine sangría is the perfect drink to have with a simple chorizo and mussels paella dish. The recipe for red wine sangría is here. Mocha chiffon cake was (is?) a popular cake in the Philippines. Whenever I went to a birthday party, whether it's a child's or an adult's, the cake served was almost always the good old reliable mocha chiffon. I haven't eaten one in the last 20 years, that is the why I baked these cupcakes for this week's Lasang Pinoy, Sundays: Whip EAT. a weekly food photography meme, Pinoy style, is hosted by SpiCes. 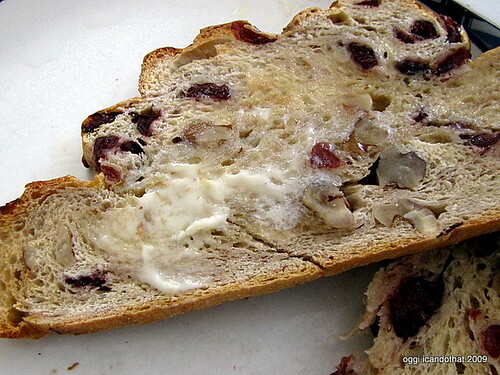 Although I love this cranberry and walnut overload bread specially when toasted and buttered, I am having a little bit of "celebration" fatigue and eager to move on to the salty crusty breads. I froze one half of the loaf so I can make the next recipe, English Muffins and then on to Focaccia, yay! I am one of the [probably] thousands of people who can't live without a jar or two of Nutella sitting in the pantry. In April of this year when I made Nutella Zebra Cheesecake, I found out to my dismay that someone in my house played a joke by leaving the walls of the Nutella jar intact while the jar is almost empty save for maybe a quarter cup making it look like the jar was still full. Not. Funny. I drove to the nearest grocery store but curses, they also ran out of Nutella! I had to make my own chocolate hazelnut spread with the hazelnut paste I had which I mixed with finely chopped milk chocolate. I bought 2 large jars of Nutella as soon as I had the chance to go to the bigger store. In a food processor, grind the hazelnuts until liquidy. Add the chocolate and process until smooth. Taste and add sugar if desired. Add oil if preferred. In a food processor, grind the hazelnuts until liquidy. 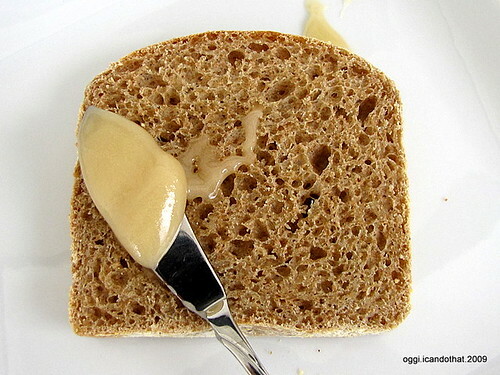 Add the honey and blend until smooth and spreadable. To prepare hazelnuts: Boil hazelnuts in a quart of water with four tablespoons of baking soda for four minutes. Drain into a colander and rinse under cold water. Some skins will pop right off. Some nuts will need you to slip them off, and a few will take a little rubbing with paper towels. Pat the nuts dry, then roast them in the oven at 350°F until they are lightly browned, about 15 to 20 minutes. The meat of one of the fresh buco I bought for buco pie is light purple in color and its water is brownish light purple. Isn't it weird? Taking a cue from this unusual buco coloring I added a thin layer of ube (purple yam) jam in between creamy buco filling. The combination is oh so delicious. Mmmm. The past week, I have been busy honing my skills in making lattice-top pie. I have never made one before because I always thought I'd make a mess of it. And I did with the first pie I practiced on, Cherry Pie. I cut the strips too thin and spaced them unevenly and they are sort of crooked which is okay I guess for a first try and I don't mind how it looks because the pie is deliciously sweet and tart. The first of the small buco pies was easier to handle. I was able to make the remaining top crusts more uniform and acceptable in appearance and I finished each one much quicker too. The recipe for Buco Pie is here; you might have to reduce the amount of cornstarch because a reader who has made this pie said the filling was gummy. Check and eyeball the consistency while cooking and add cornstarch mixture as needed. Lasang Pinoy Sundays is a weekly food photography meme, Pinoy style, hosted by SpiCes. I read a recipe of the German cheese called Quark while browsing through one of my Spanish cookbooks THE CUISINES OF SPAIN by Teresa Barrenechea. The cheese is simple to make: Pour 4 cups of whole milk in a glass jar, cover with a towel and leave on the kitchen counter for 48 hours. The milk would have set and ready to be drained on a muslin or cheesecloth. Gather the edges f the cheesecloth, twist, and tie with a string. Place the bundle on top of a sieve and place the sieve on top of a bowl. Weight down the cheesecloth with a pan filled with water. Or hang the cheesecloth on the kitchen faucet and let the whey drain. The soft solid in the cheesecloth is the quark cheese. Salt may be added to flavor the cheese. Transfer into a container and refrigerate immediately. The cheese will last for a few days. I used the cheese right away to make Quark Spätzle, the German fresh egg noodles. The noodle dish is very yummy specially with grilled pork ribs. The amount of nutmeg is perfect and I love that the spätzle is very tender. Bring a large pot of water to a boil and add 1 teaspoon salt for every quart. In a small bowl, mix flour, ½ teaspoon salt, nutmeg, and white pepper. With a wire whisk, blend the quark and eggs together in a large bowl. Stir in the flour mixture with a rubber spatula until smooth. Heat a large skillet over medium heat. Add the butter and onions. Season with salt and pepper to taste, and cook, stirring occasionally, for 5 minutes. Add the garlic and cook for another 2 minutes. Keep the heat at medium while boiling the spätzle. Push the dough through the holes of a colander, spätzle maker, or a potato ricer into the boiling water. Stir the spätzle and cook for 1 minute. Then, using a skimmer or a large slotted spoon, transfer the spätzle to the hot skillet. Raise the heat up to high and fry the noodles until they begin to turn golden. Season with nutmeg, salt, and pepper. Add the cheese and stir-fry until it begins to brown slightly. Add the water and stir-fry until it is absorbed. Add more water if you want the noodles to have a thick soupy consistency. Serve immediately. The first time I had grilled octopus was more than 25 years ago at a Korean restaurant in the Philippines. I have never eaten it since until I saw a package of frozen baby octopus at the Korean grocery earlier this week. They are really tiny, about 4 inches in diameter and when cooked shrink by only about a quarter of an inch. I didn't know how to prepare these babies and some website discussions differ on how to make them tender. The large ones, between 1 and 2 pounds each, which I have never seen in fish markets, are supposed to be boiled for 1 hour until tender before adding sauce or grilling. I halved the package which has 24 pieces, simmered the first batch for 20 minutes in spicy Spanish sauce with garlic, salt, hot pimentón (paprika), and one chopped birds-eye chili pepper. They came out slightly tender but still a bit chewy. The other 12 octopi I marinated overnight in Korean-style marinade (hot chili paste, garlic, soy sauce, sugar, salt, Korean roasted sesame seed oil) then grilled over hot charcoal for 3 minutes on each side. They came out more tender with a slight chewy bite, very very very yummy. I just love Korean seasoning on any meat or fish specially when grilled. As much as I love these babies, I don't think I'll buy them again because they are just too small and they leave me wanting for more. I'll just get large squids, cuttlefish, or the larger ones if I can find them. My favorite time during the summer is mid-July until the first week of August when the markets are brimming with fresh local produce such as rainbow chard and sour cherries. This is also the time that fresh figs appear at large groceries and Costco. One of the leafy vegetables that makes me get up early on Saturdays to go to the farmers market is the rainbow chard. This large-leafed vegetable, the leaves are 1½ feet long and a foot wide, is mild but tasty and visually appealing before and after cooking. It has a hint of bitterness not unlike arugula but it is not as bitter as broccoli rabe and it has no off-putting odor when cooked. I usually prepare this vegetable simply sautéed in olive oil, shallot, salt, a pinch of Spanish sweet pimenton, raisins, and pine nuts; very good as a side dish or to make into a vegetarian sandwich. This time for variety I browned diced pancetta and omitted the fruits, nuts, and pimenton. Delicious!. Clean the vegetables under running water, shake off excess water. Cut off 2 inches from the stem end and discard, roll the leaves and cut the chard, leaves and stems, into ½ inch slices, (or chop the leaves into 1 inch pieces if preferred). Set aside. Heat a large wok and saute pancetta until brown and slightly crisp. Transfer into a small plate and set aside. Remove all but 1 tablespoon of the rendered fat in the wok, add the shallots and cook until soft. Put the chard, pancetta, and salt into the wok and stir fry for 1 minute, cover the wok, and cook on medium heat for 3 to 4 minutes or until chard is wilted and tender but still crisp. Transfer into a serving dish. The Bread Baker's Apprentice Challenge is almost 2 months old and I am finished baking the 10th recipe, Corn Bread. 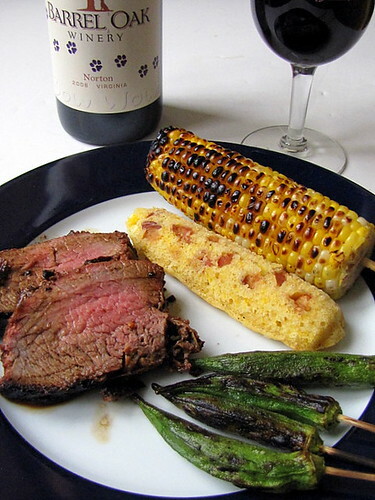 I made it the other Saturday for our 4th of July barbecue dinner and we all loved it, and we don't normally like corn bread! 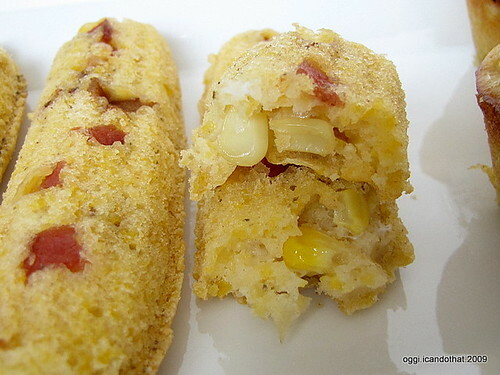 PR's recipe is not the typical corn bread from the south because it has wheat flour, fresh corn, and loads of sweet stuff: white and brown sugar and honey. I halved the sugar and honey because I don't like overly sweet corn bread. They came out just sweet enough with the addition of the extra sweet yellow/white corn that I used. I prefer it saltier and I will add a pinch more of salt next time I make these. I really enjoyed the crunch of the polenta and the fresh corn; this corn bread is superior to the ones I have previously tasted. Better yet, I am declaring this is the bestest corn bread, ever! Thank you Peter for including this baking powder and baking soda bread in the book. I baked some of the corn bread in a cast iron mold that has 7 slots shaped like corn. I sprinkled the bottom with chopped bacon to make them visible after unmolding. The corn molds are small, shallow, and can hold only 2 tablespoons of batter but they are so cute and fun to serve and eat. I baked the rest of the batter in unlined regular-size muffin pans. 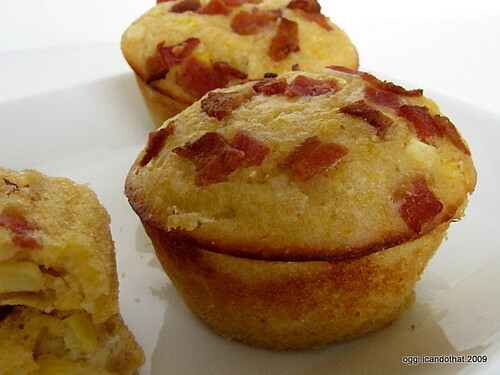 If you are baking these in muffin pans, use cupcake liners or line the bottoms with parchment because they stick to the bottom and it is difficult removing them from the pan. I also increased the heat to 400°F because the bread would not brown enough, specially the ones baked in the cast iron pan. 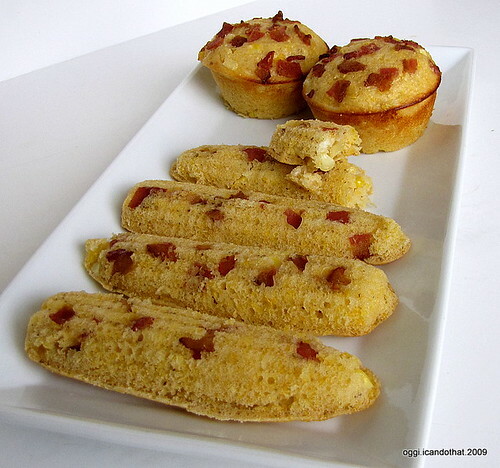 chewy crunchy polenta corn grits, crunchy sweet fresh corn, and salty bacon, yum! Put the almonds and sugar in a blender with 1 cup water and blend until almond is pulverized. Line a fine sieve with a layer of muslin, place over a bowl and pour the almond mixture into the strainer. Add 3 tablespoons water into the blender and blend briefly to clean the blender of any almond residue. Pour into the strainer. Gather the edges of the muslin, twist, and press to extract all the liquids. Open the muslin and place it over the sieve again, add another 4 tablespoons of water on the almond pulp, stir and repeat the extraction process. Discard the almond pulp. Remove the sieve and stir in the almond extract, rosewater, and milk into the almond liquid, taste and adjust sugar. Chill for at least one hour and serve (with a petal or two of unsprayed pink rose floating on top of each drink). Lasang Pinoy Sundays is a weekly food photography meme, Filipino style, is hosted by SpiCes. Pinakbet is my favorite Filipino vegetable dish. I never get tired of it. Once in a while I cook it without the usual prawns and bagnet (pork belly confit). This time I added just a little bit of cured pork skins and I also used squash blossoms from my garden's acorn squash plant. I planted the squash so I can have fresh blossoms all summer long for my pinakbet. Those tiny green rounds are 2 day old fruits; they are incredibly crunchy and yes, the whole dish is moist and flavorful. 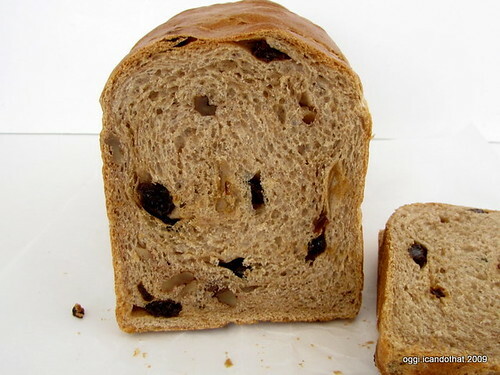 The next day I made another half recipe minus ¼ cup of raisins. 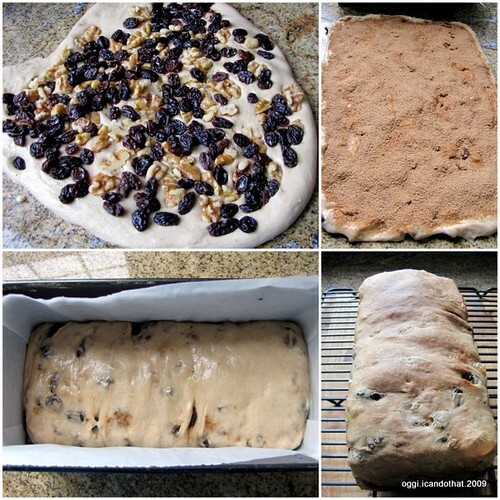 I let the dough relax for 1 hour before kneading in the raisins and walnuts, omitted the cinnamon sugar swirl, and let it rise for 2 hours before shaping into a loaf. The second rising took 90 minutes and the bread had an oven spring of about an inch resulting in a much lighter loaf although I miss the flavor burst of the cinnamon sugar. 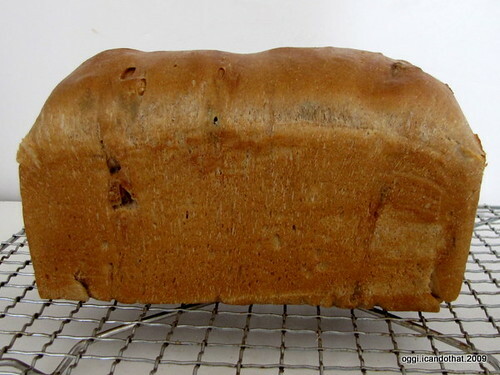 I will bake this bread again, perhaps with some whole wheat flour, and of course, the cinnamon sugar filling.